All Animals Veterinary Hospital welcomes all birds! Looking for a trustworthy vet for your bird? Animals Veterinary Hospital is an Avian Specialty Practice and Dr. Attila Molnar is a Board Certified Avian Specialist with extensive skills and expertise in avian medicine. One can say he has the knowledge and compassion to become your bird vet in Los Angeles. Whether you are looking for a comprehensive exam, blood work, or a place to board your bird — we’d love to meet you! Birds are very different in anatomy and physiology to dogs and cats, requiring specialized care administered by a qualified avian veterinarian. Contrary to popular belief, most veterinarians are NOT trained in veterinary school to deal with every species of animal they might come across in a private practice. They are required to learn about the domestic SPECIES (dogs, cats, horses, cows, etc. ), but not what are termed exotic animals. Board Certified Avian Practitioners have extensive training that is beyond the scope of a standard veterinary school. All Animals Veterinary Hospital in Calabasas offers state-of-the-art avian boarding. 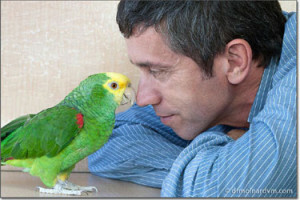 Your birds will love staying here under the care of Dr. Molnar and his compassionate staff. We understand that all birds are different — and that’s why our stress-free facility is a great place for boarding your bird in the Calabasas and Greater Los Angeles areas. We offer indoor boarding in our calm, quiet and temperature/humidity controlled avian ward. We also have a safe and secure outdoor aviary. If your bird is particular about its environment, special accommodations are available for your bird’s personal cage. Our guests come from Encino, Santa Barbara, Santa Monica, and just about every other city in Southern California. No matter what, you can expect our staff to always provide exceptional service and compassionate care to your bird. Whether it’s your first visit or your bird boards with us on a regular basis, he or she will feel welcome and safe when visiting All Animals Veterinary Hospital. Every new bird that enters a new household should have a thorough exam, a thorough dietary and behavior consultation, and baseline laboratory testing. It’s very important the way the avian veterinarian handles the bird at the first visit and all the other visits at the veterinary hospital. Birds are highly intelligent creatures; they have to feel safe and comfortable during the exam and any diagnostic procedures. They should step up on the avian veterinarians hand, proper toweling techniques should be used to prevent any unnecessary distress and fright that might cause future fear-based behaviors and reluctance to be toweled. Every new bird owner is trained about proper toweling techniques that will have to be practiced at home, in order to desensitize the birds. If toweling only happens at the veterinary hospital or at a pet store during grooming procedures, most birds will become resentful and scared of the towel. Owners should towel their birds on a routine basis without performing any peculiar procedure and then reward them for it, so the bird does not associate the towel with something unpleasant. We discuss proper grooming, socialization and handling recommendations are made including consultation on flying strategies. It is very important for young birds to have proper early socialization, and to learn all the skills that they would learn in the wild, including flying and proper foraging. One of the biggest mistakes made in aviculture is to trim the wings in fledging birds. Learning how to fly and how to properly land is one of the most important skills that every bird has to learn. Imagine our parents not teaching us how to walk or tying our legs together and placing us in a wheelchair and rolling us around. This is exactly what we do to most of our pet birds with negative consequences. Bird owners are also advised on proper socialization, what is appropriate and what is not appropriate when handling and interacting with the new bird. Improper socialization can lead to behavior problems in the future which can be quite difficult and costly to treat. Owners are advised on proper grooming pending on the species and age of the avian patient. We like to teach our clients to do the basic grooming at home as long as they feel comfortable to do it. We advise all our new bird owners how to train their pets as well as basic behaviors that will reduce the stress of handling, grooming, and medicating. This includes proper and continuous toweling, home grooming procedures without restraint, and getting them used to taking liquid from a small syringe in case they will have to be medicated in the future. With the help of a stethoscope, the heart, lung, and air sac sounds are also evaluated. Dr. Molnar has years of experience performing surgical procedures on birds. Of course, anesthesia is used to eliminate the patient’s stress and pain during surgery. It allows us to obtain a tissue sample for a biopsy, as well as perform regular and emergency surgeries. For birds, use of anesthesia can be tricky, which is why Dr. Molnar’s experience, training, and education allow for him to take special steps to keep a bird’s optimal body temperature as well as other concerns to ensure that your bird is under the best care possible. General anesthesia may be needed for emergencies such as the repair of a broken limb or the relief of egg binding in birds.